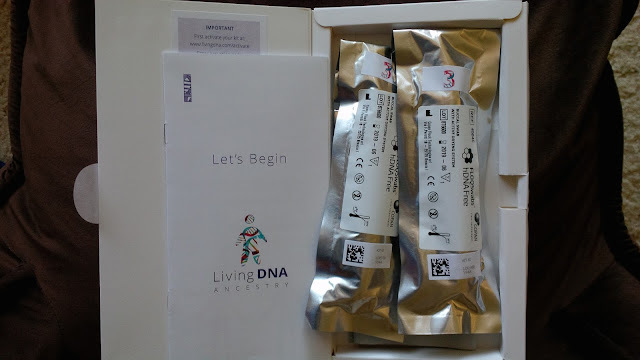 I mailed in my complimentary Living DNA kit at the end of October. The test is performed using the Illumina Global Screening Array Chip. 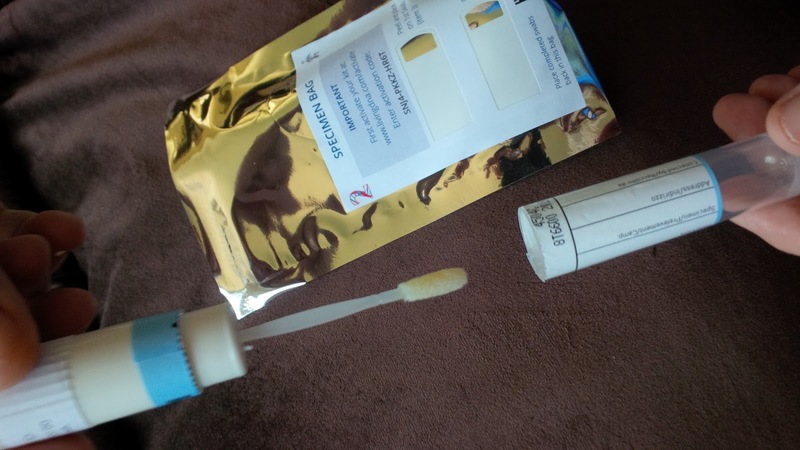 I took some photos of the kit, so testers will know what to expect. Living DNA uses a swab for sample collection, as shown here. There are two in each kit. 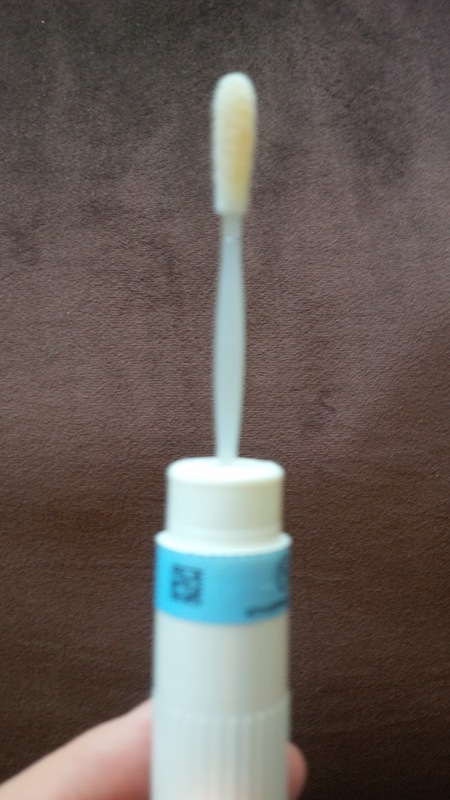 The collection process is relatively easy and involves no liquid. 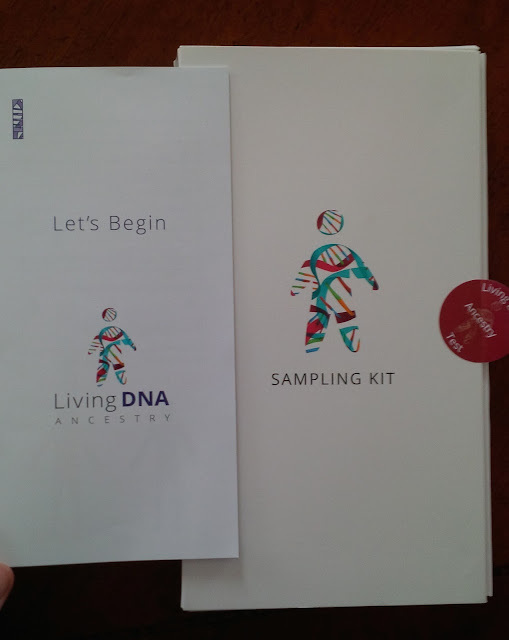 Although Living DNA is a British company, the mailing address for my kit was Eurofins Genomics in Louisville, Kentucky. (Eurofins is one of their partners according to the website, and the testing is done in Denmark.) 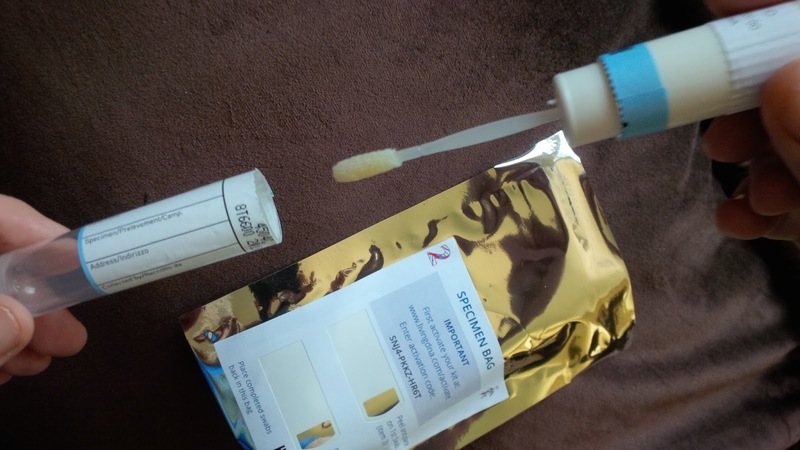 The decision to use swabs for DNA collection instead of saliva, undoubtedly, makes shipping the samples to the lab from the United States, and internationally within Europe, simpler. I received my results on February 7th, just as I was leaving for RootsTech. Now that I am home, I have had a chance to finally look them over. My results include an admixture prediction (percentages of overall ancestral origins based on autosomal DNA) and my mtDNA haplogroup (which was correct - U5b1b2). Males will also receive their Y-DNA haplogroup. Currently, there is no relative matching feature, but it is expected to be added in the near future, which will be essential for genealogical and unknown parentage applications. This will be a terrific addition to the U.S.-based databases we already use in our research, since it will have a unique British, and presumably, European market. I was excited to receive these results since I have recent English ancestry and they promised to provide a very detailed breakdown of ancestral origins within the British Isles, with 21 separate categories. You can see the descriptions of those categories here. Like 23andMe's former version of Ancestry Composition, the admixture results are presented at three different levels: Global, Regional and Sub-Regions. At 23andMe, I am 100% European. At AncestryDNA, I am 99% European. At Family Tree DNA, I am 97% European. At 23andMe, I am 24.8% British/Irish and 22% Finnish. At AncestryDNA, I am 0% Great Britain, 10% Irish and 21% Finland/Northwest Russia. At Family Tree DNA, I am 27% British Isles and 23% Finland and Northern Siberian. I do not accept that explanation and I hope their other customers will not be misled by it either. It is absurd to claim that it is realistically possible to inherit 0% of a grandparent's DNA. LivingDNA estimates that 81.7% of my DNA comes from Great Britain and Ireland. That is a significant overestimate. I have one great grandfather of full British ancestry (~12.5%) and one second great grandmother of full British ancestry (~6.25%). All of the rest of my known British ancestry, with the exception of two possible Irish 5th great grandparents, is Colonial American. I do have some genealogical brick walls, but my matches on those lines do not indicate that behind any of them is a recent British ancestor. The other reputable companies estimate I am between 10% - 27% British/Irish. I also have a great grandparent of full Norwegian ancestry as well as a significant amount of German ancestry. According to these results, my ancestors came from many different areas of England, which is certainly possible if you look very deep into my pedigree, back to my immigrant ancestors in the 1600's. Focusing on my more recent English ancestors, let's see if these estimates are consistent with their known origins. My great grandfather, George Henry Allen was born in Australia, but both of his parents, George Allen (b.1851) and Flora Chitts (b.1849) were born in Gloucestershire, England, as were their known ancestors. So, I should have inherited about 12.5% of my DNA from this area. According to this page, Gloucestershire ancestry would fall into the South Central England sub-region. I have an estimated 8% from this category. So, a little low, but not impossible when taking into account the randomness of recombination. My third great grandfather Thomas Armstrong was born 1801 in Cumberland (as were his known ancestors). I would have inherited approximately 3.125% of my DNA from him. The area that was once Cumberland is now part of Cumbria. According to Living DNA I have 6.4% in the Cumbria category. My third great grandmother Dorothy Hudspith was born 1811 in Northumberland (as were her known ancestors). I would carry about 3.125% of her DNA. Northumberland would be in the Northumbria category. 0% of my DNA is predicted to have originated in Northumbria. As I mentioned, I have two unconfirmed fifth great grandparents from Ireland (on different lines). One of them was reportedly born in County Armagh. If this is accurate, then I would expect to have about 1.56% of Irish DNA. I have 2.1% in the Southwest Scotland and Northern Ireland category, so this appears to be roughly consistent. Due to my large amount of distant Colonial American ancestry, my overall British DNA is likely a challenge to specifically categorize. Focusing on my last six generations, these results were not consistent with my known ancestry. Failing to recognize half of my Finnish ancestry and significantly underestimating my Norwegian/Scandinavian ancestry does not inspire confidence. The site explained that German ancestry could be included in the Southeast England category, so that may explain why none of mine showed up elsewhere. Even with this caveat, however, this does not accurately portray my ancestral origins. I suspect that I am not the only one who will see over-inflated British percentages, but that remains to be seen when more results are delivered and reviews published. This test's launch has been highly anticipated and has definitely been getting a lot of buzz, but I think it is important to recognize that any time a company is claiming to provide very specific sub-regional percentages, we must take it with a big dose of salt. As always, I support and appreciate the efforts to advance our field. It has to start somewhere and we can't expect perfection. I look forward to improvements and the future of this exciting company. If you are interested in seeing what Living DNA will predict for you, you can order your kit here.